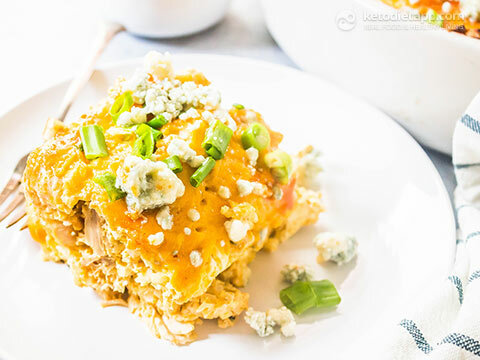 You’re going to love this tangy keto Buffalo Chicken Casserole! 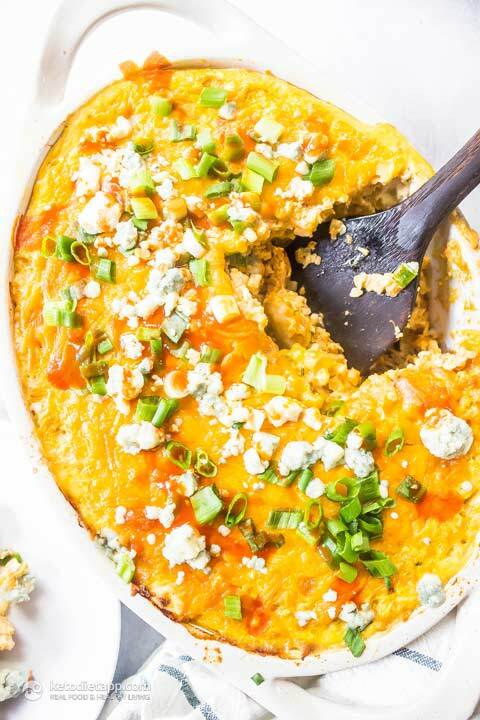 This low-carb casserole recipe is super easy to throw together, especially if you use any leftover rotisserie chicken to cut down on prep time. 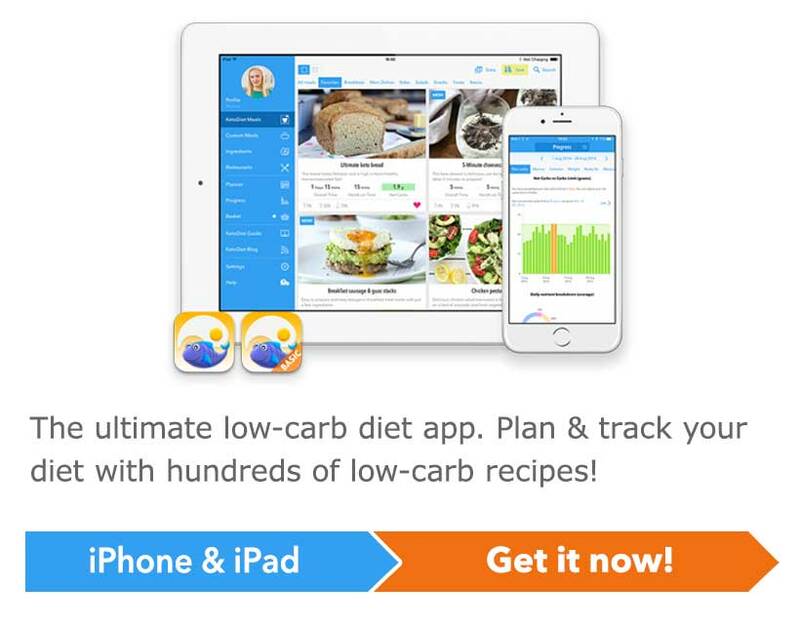 No starchy vegetables, no potatoes and no grains - just nutrient dense keto-friendly ingredients! 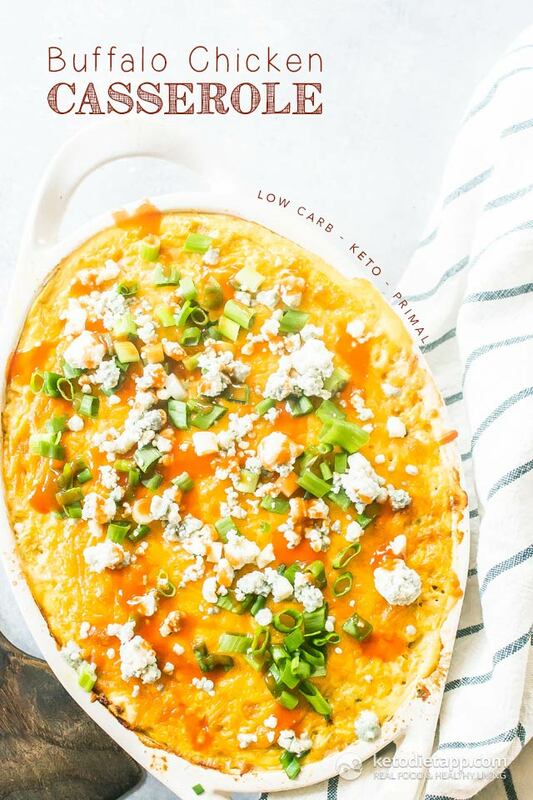 You can prepare the cauli-rice in advance, keep it in the fridge and have it ready to make a quick mid week keto dinner. Optionally, serve with a bowl of crispy green salad dressed in olive oil wit a touch of buffalo sauce. Preheat oven to 225 °C/ 400 °F. 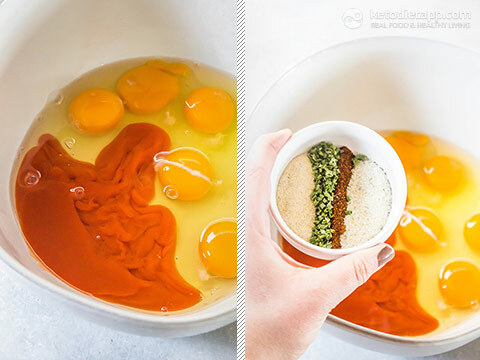 Combine the eggs, buffalo sauce, and spices in a large mixing bowl. 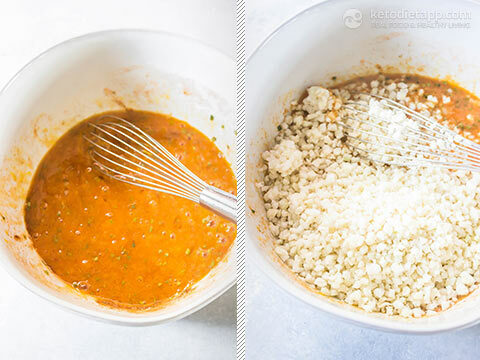 Whisk just until the ingredients are incorporated, add the cauliflower rice (here&apos;s how you can make cauli-rice) to the bowl and stir to combine. Fold in the softened cream cheese. 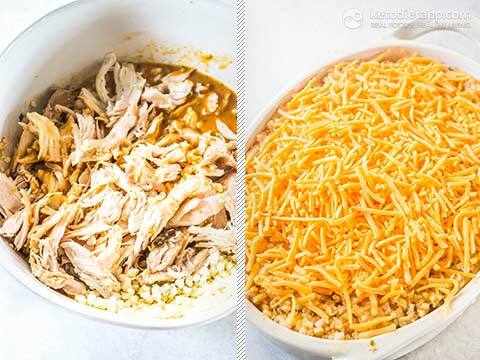 Add the pulled chicken to the mixture then transfer to a 9 x 11 inch (23 x 28 cm) baking dish and top with the shredded cheddar cheese. Bake for 45 to 60 minutes, until the eggs are set and the cauliflower is firm. To serve, top with desired toppings. Hi! 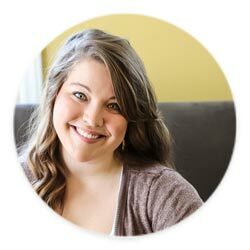 I was wondering if there were other variations you have tried of this recipe. I love the buffalo chicken one. However, I was wondering if you have tried substituting bbq for the buffalo sauce? Would that work alright? Then use white or red onions instead of green onions. When it comes to onions, red, white or yellow sound great (just remember they are a little higher in carbs compared to green onions). I hope this helps! I made this last night and it was very tasty! It passed the husband test as he didn’t ask “is there cauliflower in this?” and he said it was very good. The portion size is large, so good for a day when you feel hungry. The texture surprised me a bit, it was quite dense, but still moist. I cooked mine at 200°C for 45 minutes and the cheese was much browner than in your picture. I lowered the temperature as I felt 225°C is a very hot oven (400°F =204°C, so I went for a lower setting). I maybe should have taken it out sooner....I let it cool for 10 minutes before serving. The blue cheese and spring onion topping are a must. Very good...thank you! Diane, thank you for your lovely feedback and temperature tips! I really liked the recipe, came out really great. Great Flavor. Really large portion sizes so you won't be hungry after this meal. Only thing that struck me was it tasted a tad egg-y when reheated. But still a really great recipe. Thank you! I think you could use fewer eggs and add some shredded cheese. I don't have the weight but I just pre-cut it in 6 equal pieces, ideally after leaving it to cool for 15-20 minutes.